Luister naar je audioboek op Apple- (iOS) of Android-telefoons en -tablets. Na 30 dagen krijg je er elke maand eentje voor slechts $12.99 CAD. Je kunt altijd annuleren. *Inwoners van Quebec krijgen in hun eerste maand 2 audioboeken in plaats van een gratis proefversie. Niet in Canada? Kies de winkel van het land waar je je in bevindt om verkrijgbare boeken te zien. Like every other hobbit, Bilbo Baggins likes nothing better than a quiet evening in his snug hole in the ground, dining on a sumptuous dinner in front of a fire. 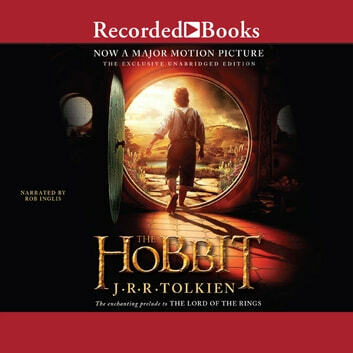 But when a wandering wizard captivates him with tales of the unknown, Bilbo becomes restless. Soon he joins the wizard's band of homeless dwarves in search of giant spiders, savage wolves, and other dangers. Bilbo quickly tires of the quest for adventure and longs for the security of his familiar home. But before he can return to his life of comfort, he must face the greatest threat of all-a treasure-troving dragon named Smaug. In his fantasy classic, master storyteller J.R.R. 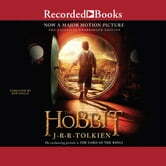 Tolkein creates a bewitching world filled with delightful creatures and thrilling dangers. Narrator Rob Inglis will hold listeners of all ages spellbound with his skillful portrayal of hobbits, dwarves, and enchanted beasts. Great story, great narration. Felt like I could listen to it leisurely without having to be solely focused on just this activity.